Back in 2010, with a young family, we had just bought our first home; a 100 year old house on the outskirts of Media. To say I had been an apprehensive home buyer would have been a tremendous understatement. We left a huge apartment with a beautiful classic wood interior a couple blocks from downtown Ardmore. I truly loved living in Ardmore and greatly appreciated the freedom of not being responsible for any maintenance issues that popped up, but my family had grown and it was time for a second floor and a yard. Just after moving in and incurring those initial costs, one after another, I, like many first time home buyers, started second guessing what had been by far the largest purchase of my life. What had seemed charming, quaint, and classic when originally buying the house, I now feared might just be old, worn, and dilapidated. Not being very handy, I was concerned about owning a money pit that would detract from our ability to travel and vacation in nature as my wife and I had so freely done just a few short childless years ago. In addition to being able to walk to town and the now-questioned charm of the house, one of the main reasons we had bought this house was the proximity to nature. That first Saturday morning I took Kailey, my oldest daughter, then just barely 3, for a walk in nearby Glen Providence Park. After we entered through the clearing with a smattering of trees, we meandered down wooded switchbacks that had me indulging in the nostalgia of backpacking and canoeing trips with my own father in my youth. With the cover from spring foliage in full force, by the time we were halfway down the switchback, this pocket of woods just outside of town felt as though we could have been deep in a secluded forest. When the trail opened up onto a large pond, we took the opportunity to sit with, watch, and listen to nature. There were all the typical sights and sounds of a park: birds darting from here to there, frogs croaking in the pond, butterflies fluttering about, and so on. 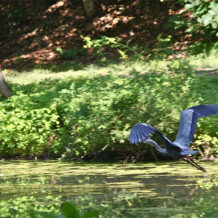 Then we saw whom we ever since have referred to as “Harry the Heron.” He was a beautiful Great Blue Heron. We watched as he strolled along the opposite edge of the pond, until his focus zeroed in on a spot just a few inches into the water. Slowly he moved closer and closer, and then, like an arrow being released from a bow, his head and beak shot out and struck a frog. My daughter stayed fixated and amazed as he first consumed the frog and then returned to patrolling the banks of the pond. We continued to watch as Harry tracked down and caught a few more prey items. It was in that moment that I found a sense of comfort with our recent purchase. Seeing this experience through her fresh eyes, I realized we did not need to take our daughters on an African Safari, down the Amazon, or to Yellowstone for them to see and appreciate nature. If we were quiet and patient, we had all that beauty, those scenes and stories, unfolding in our own backyard…in Glen Providence Park. It was to be the beginning of the wonderful appreciation of nature just blossoming within her. Dylan Atkins is a Board Member of Friends of Glen Providence Park. He gives credit to his daughter Kailey for editing this piece with him.